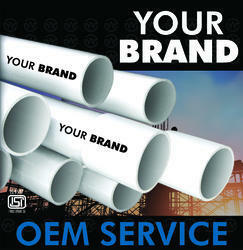 Want to launch ISI PVC Conduit Pipes and fittings in your own brand name? You have come to the right place. We are one of the most reputed manufacturers of PVC Conduit Pipes & Fittings. We can manufacture pvc conduit pipes and fittings in your OWN BRAND, according to your specific requirements. Our pipes are manufactured as per IS:9537:PART 3:1983 specifications, and we are the OEM for several big brands.